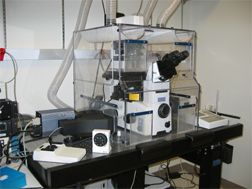 The Confocal Microscope Core Facility administered by the Department of Neuroscience, Munroe-Meyer Institute at UNMC. This core provides state of the art digital imaging optical microscopes, quantitative software applications, and expert technical assistance. 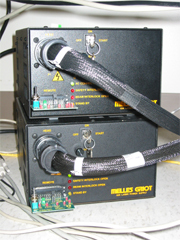 The resources available at the facility include a Nikon Swept Field advanced laser-scanning confocal microscope (LSCM), a Cascade 512B high quantum efficiency digital camera, Quadview system for Fluorescent Resonance Energy Transfer (FRET) imaging, a fully motorized inverted wide-field imaging microscope (Nikon TE-2000U) for quantitative live-cell and multidimensional imaging, Eppendorf microinjection system, and two computer stations for on and off-line image processing and analysis. Fluorescence microscopy is an advanced technique widely used in biomedical research. 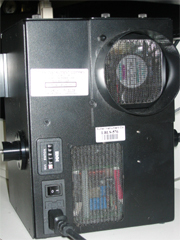 Though highly useful for most applications, the technique experiences serious limitations, notably fuzzy images and phototoxicity. The fuzziness arises from interference, such as diffraction and spherical aberration, and phototoxicity partly derived from the formation of oxygen radicals due to non-radiative energy transfer. A high numerical aperture objective lens provides an in-focus image of a thin plane within the specimen. However, the information from this optical section is often obscured by out of focus interference from fluorescent structures above and below the plane of focus. Confocal imaging and digital deconvolution are two techniques that have been developed to correct this problem. Although both confocal imaging and computer deconvolution can be effective in virtually eliminating out-of-focus interference, they do nothing to improve phototoxicity. When a fluorophore is excited, there is a probability that instead of decaying to a singlet state and emitting a fluorescence photon, a very reactive triplet state can occur. These relatively long-lived states can damage living cells and bleach the fluorophore in part by the generation of highly reactive singlet oxygens. This problem can be cleared somewhat by soaking fixed specimens in antioxidants (so-called antifade reagents). However, this approach is not applicable for living samples and both photobleaching and phototoxicity can be very extensive for long-term imaging. Our high-speed multiple pinhole/slit scanning system configuration with an ultra quantum efficiency CCD camera enables us to perform long-term fluorescent live imaging with minimum photobleaching. Argon and Argon/Krypton lasers with 488, 514, 568, and 647nm wavelengths connected to the sweptfield scanner head for confocal imaging. Quad View FRET module for up to 4 color FRET (Fluorescence Resonance Energy Transfer) imaging.